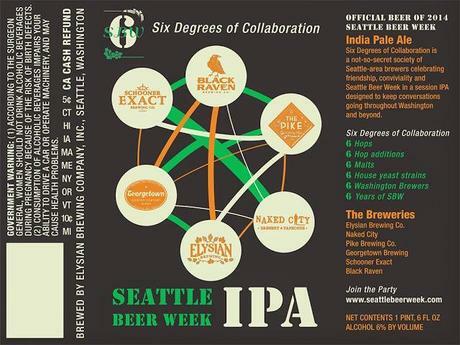 For the 6th annual Seattle Beer Week, the organizers brought together brewers from six different Seattle breweries to come up with a beer. They ended up using six malts, six hop varieties added at six different times, and six different house yeasts. They stretch the terms of “session IPA” with this 6% ABV beer, but their goal was to make something hoppy that you can have a few of during the SBW festivities. This definitely qualifies. It is currently available around town in 22oz bottles, and it will be available on draught starting with the opening SBW event at Elysian on Thursday, May 8. Citrus & pine hop aromas pop out of the glass of this dark golden beer with a medium head that sticks around nicely. The flavor follows with a moderate amount of fruity, floral and green hop flavors backed by a solid pale malt base. Despite six different malts being used, I don’t pick up any caramel malt flavors, which is fine by me. The bitterness is assertive and lingering, and like many NW IPAs, I wouldn’t call this balanced. It is quite dry, with little sweetness to be found. It is clean with no off flavors, and it certainly represents Seattle well with its hop-forward nature. This is a solid IPA, but for the level of bitterness here I wish the hop flavors were more prominent. That said, I’ll happily have a few of these during SBW, and I’ll look forward to trying this on draught. Nice review Geoff, thanks for the info! …like your comment about the lack of caramel malt, which imo has no place in bracing IPAs. I’m drinking this for the first time tonight @ Hopvine, and I gotta say, this is one of my favorite new beers of the last few years –sort of surprising, as (again, imo) beers by committee don’t always come together. SDOC reminds me–in a very good way–of the complex, multi-variate hop flavors of Breakside Wanderlust IPA …super balanced, a very light bitterness (at least, what I’m tasting on tap), and as you say, nice pine & citrus notes. Cheers & congrats to all six breweries involved in this inspired collaboration!